Things have been a little quiet around here lately, but with good reason: I’ve been making soap! 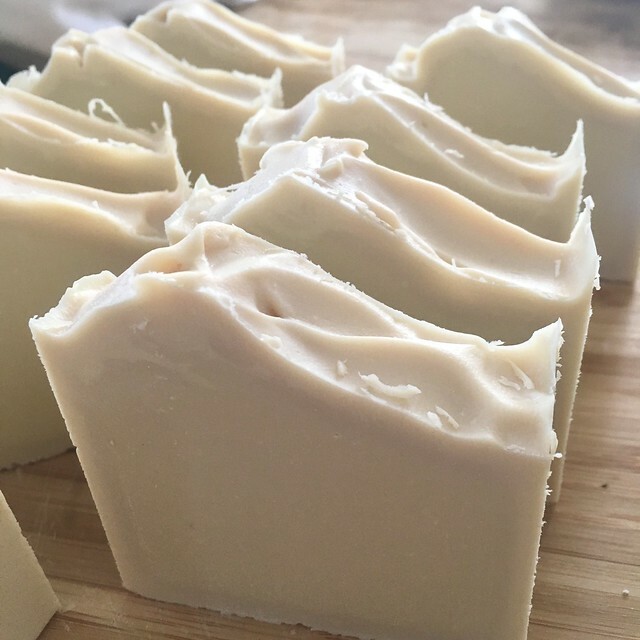 I’ve experimented with soap making in the past, first with melt & pour soap, and then even making my first batch of cold process soap a few months ago. And now I’ve fallen down the rabbit hole. 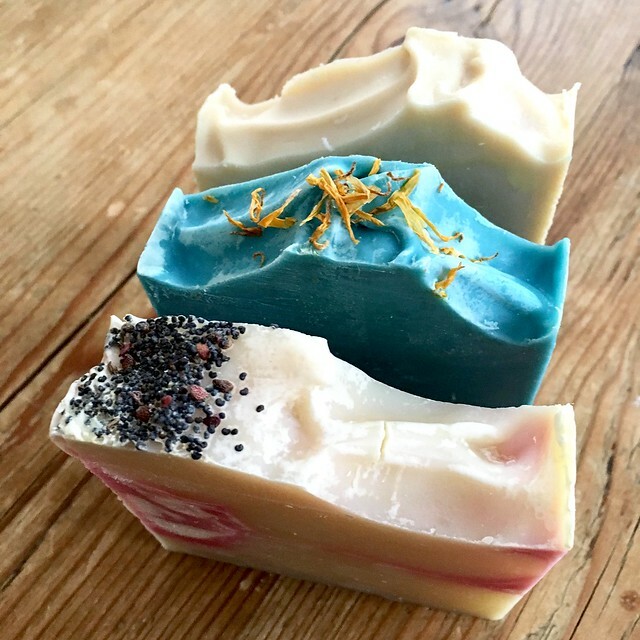 I’m still making cards, and have lots of ideas there (though not a ton of mojo at the moment), but I hope you won’t mind if I share my soap-making adventures here, too. 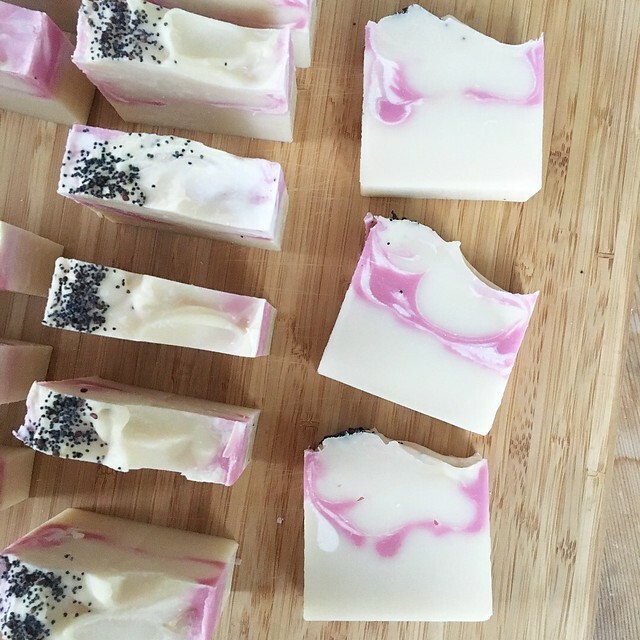 I’m still experimenting with recipes – trying to figure out exactly which combinations of ingredients I like best for my bars – but so far I’ve made a few very different soaps. The best part is that they’re all made with a limited amount of natural ingredients, all of which I can pronounce! This has become increasingly important to me when it comes to skin care, especially because I have some skin sensitivities and allergies that like to cause me trouble from time to time. It also helps that the final hand-made product is just so pretty! 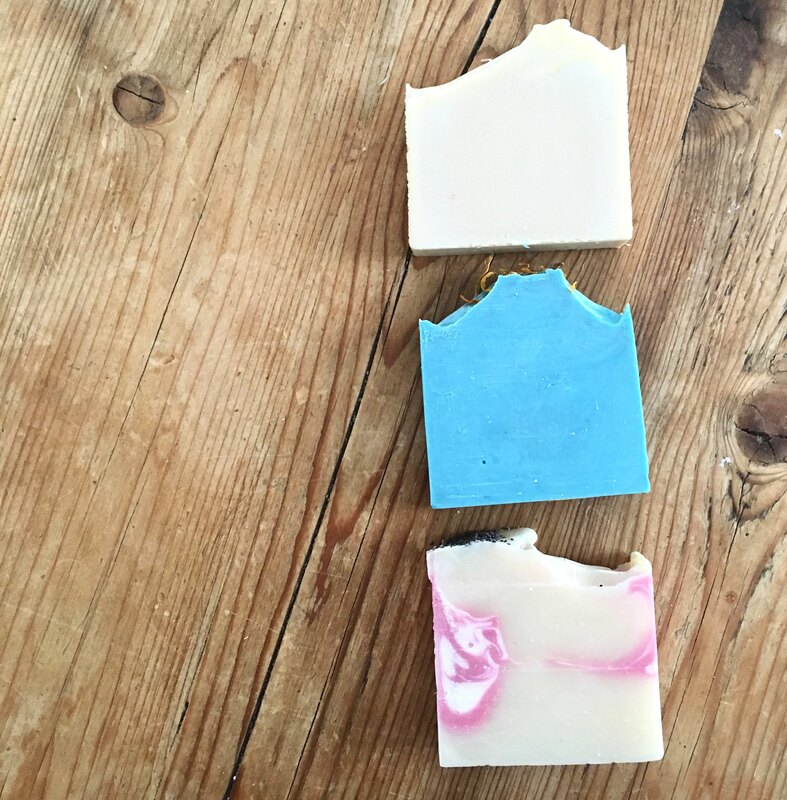 The first in this set of three soaps is a bar made with coconut, olive, palm (sustainably sourced!) and sweet almond oils, shea butter, mica colorant, and what I’m currently calling a “proprietary fragrance blend” (because I blended a bunch of fragrances to get something I like and it now smells fresh and fruity but I’m not yet very good at naming or describing fragrances…). Plus some good old H20. :) I experimented with a drop swirl technique for these, and sprinkled a mixture of raspberry and poppy seeds on top. 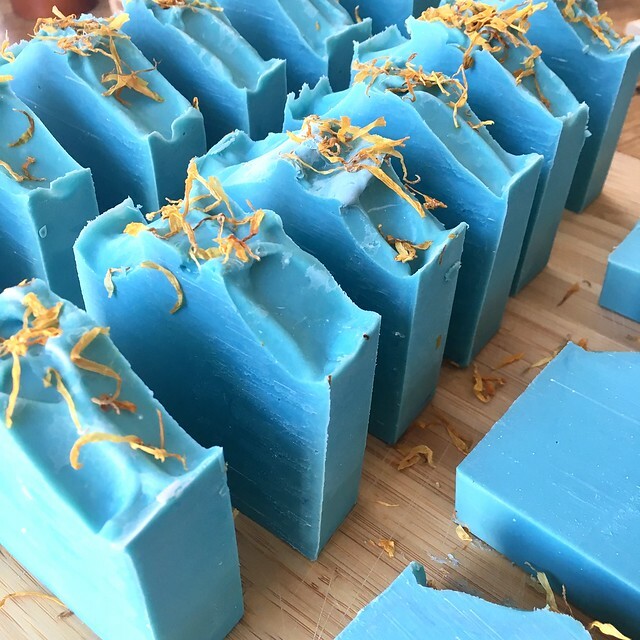 I also made this beautiful blue soap with some calendula leaves sprinkled on top. I love the contrast of the two colors! 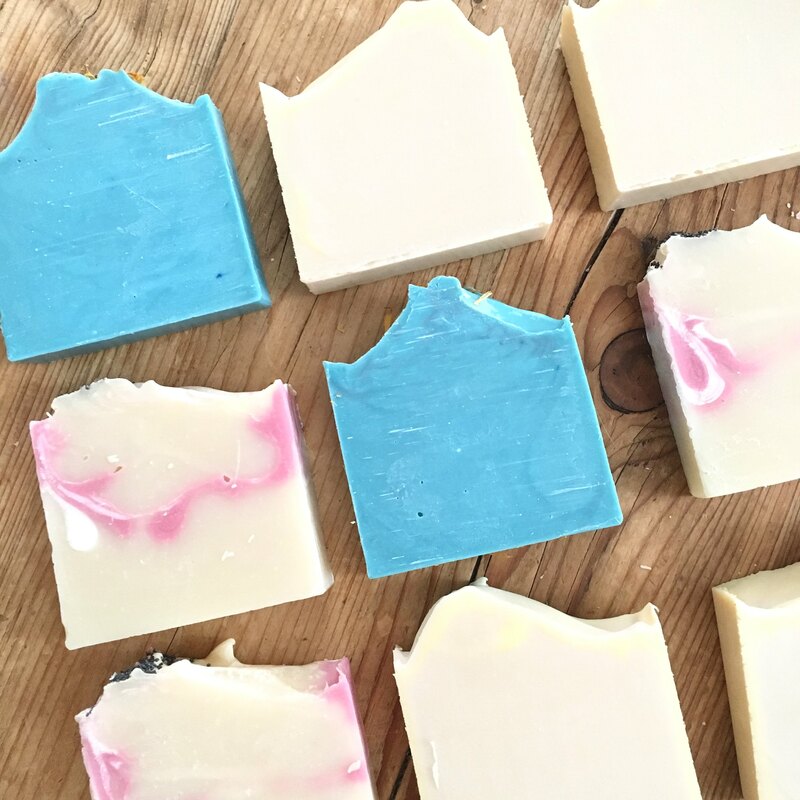 Ingredients for these soaps include coconut, olive, palm (sustainably sourced! ), sweet almond and castor oils, shea butter, mica colorant, fragrance and water. These bars have a slightly citrus-y scent that I love. The third is a traditional Castile soap which means the only oil used in this soap is 100% olive oil. I followed this recipe. It has an oatmeal & honey fragrance that smells really lovely. I can’t wait to try this one out! My plan is to keep experimenting with recipes and designs and see where I end up. So far I’m having lots of fun, even in the troubleshooting phases! Let me know in the comments if you’d be interested in seeing more posts about soap! I love seeing all your soaps! You should do a video/story on instagram about cutting them. Cause I’m weird like that and I’m sure it’s so satisfying to watch :) they look so nice! Hi Becky! I love watching those kinds of videos, too! I’ll try to post one on Instagram next time I cut some soap!